Tyler Nguyen started out studying international affairs in Vietnam. During his first year, he studied Introductory Microeconomics and then experienced the Global Financial Crisis (GFC), like so many of us, by late 2008. The more he studied, the more he realised the importance of understanding how a business operates and developing sound knowledge of financial markets and the economy. Nguyen currently works as an analyst at NAB, one of the big four banks in Australia. In his current role, he finds himself running in and out of meetings and juggling different tasks throughout the day, from data extraction through to SQL coding and crunching numbers, to writing insights commentary, or working on new reporting dashboard templates. 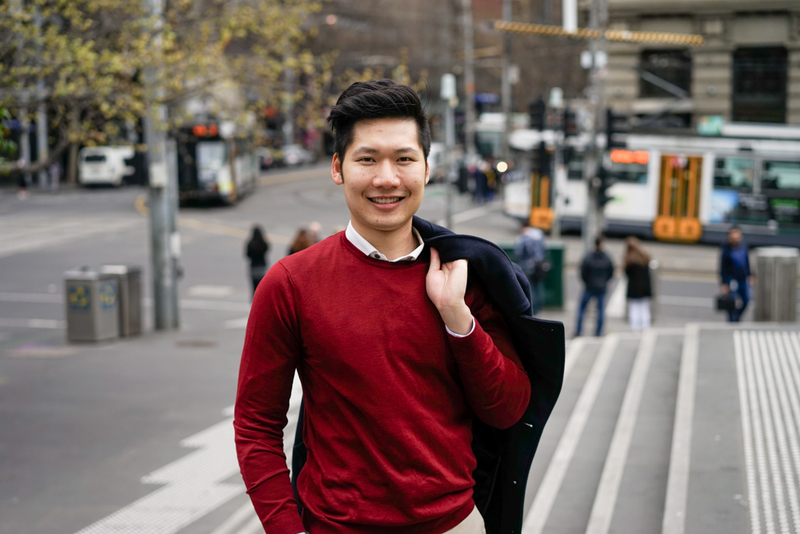 We recently caught up with Tyler, who shared his rewarding experience as an international student studying the Bachelor of Commerce and Master of Management (Accounting), both of which he earned first-class honours in. He also reveals his top tips for students from Vietnam planning to study Finance or Accounting in Australia. You completed both your Bachelor of Commerce and a Master of Management (Accounting) at UniMelb. Had you always wanted to study overseas? Why did you choose the University of Melbourne? I was quite fortunate to have been able to live and study in different countries growing up, and yes, it had always been my plan to continue my tertiary education overseas. My father was a diplomat so I’ve had the opportunity to live in places such as Tokyo and, later, Canberra. It was a big change moving from a city like Tokyo to Canberra, but that also allowed me to visit Melbourne a few times, and I came to really like the city. I chose The University of Melbourne for its reputation as the finest higher-learning institution in Australia, and also Melbourne as a city, for its peaceful and multicultural environment. I think it’s the perfect place to live and study with plenty to do and enjoy with a vibrant culture. During your time at the University of Melbourne, you undertook an Exchange semester at Wharton. What were your highlights and why would you recommend exchange studies to other students? I think the opportunity to study at Wharton – one of the best business schools in the US and the world – in itself is already a highlight. But more than that, I got to live and study 'on campus' along with other local and exchange students, which was very different to my experience in Melbourne. I was also able to have the 'spring break' experience in Cancun: to be able to cap off my exchange semester with three weeks of travelling through the US was certainly very memorable. For your Masters, you received the AG Whitlam International Graduate Scholarship. What impact did this have on you and your family? Financially, of course, it definitely helped my family as the scholarship covered half of the tuition fee. Personally, it was rewarding to be a recipient of this merit scholarship, to see your hard work and effort recognised in such a way. While you were studying your Masters, you secured an internship at PWC in Vietnam, tell us about that experience and how you feel it helped you secure your current role. The internship at PwC in Vietnam was invaluable, as I was able to directly apply my knowledge in accounting and financial valuation in performing financial due diligence analyses for merger and acquisition transactions. Perhaps even more significant was gaining other technical and soft skills that make you 'job-ready' after your studies, from financial spreadsheet-ing and modelling in a practical context, to interacting and networking in a professional environment with clients and stakeholders. This internship along with other work experience was vital in securing my current role, as employers are always looking for much more than just degrees and transcripts in a candidate. They want to know how a person has strived to develop and equip themselves with the required skills, demonstrating the willingness to learn and hit the ground running from day one. What did you enjoy most about your Melbourne Business School (MBS) experience? My master’s degree at Melbourne Business School was a very different experience to my undergrad years. Students are more mature as many of them have working experience, and, in general, have a clearer idea of what they want to, and can expect to, achieve from their studies. I really enjoyed being around people who can offer different perspectives and provide guidance and mentoring for professional development. There were also many sponsored events, case studies and competitions that are tailored to your field of interest; cumulatively, these enable students to learn and challenge themselves in a simulated, professional environment. The ones that stood out were the Strategy Presentation Challenge (SPC) that I participated in twice, and the UBS Investment Banking Challenge (UBS IBC). For SPC, the first topic was to build a strategic campaign, product or service that aligns with the 'local bank' brand of the then newly established Bank of Melbourne. The other time was to design a retail branch concept for the National Australia Bank. For the UBS IBC, we were given a case study based on an actual recently conducted merger, and asked to conduct financial and strategic analyses of the transaction, then present our findings and recommendations to the board. What are your top tips for students from Vietnam planning to study Finance or Accounting in Australia? I would say the first and perhaps most important thing is to really understand yourself: your strengths and weaknesses, what you are passionate about, what you want to learn and get out of your study, and at the end of it what you see yourself doing. Do your research into the fields and subjects that you plan to study and decide if you can see yourself studying it for the next 3-4 years. If you are an incoming undergrad, always keep an open mind and take up new challenges. Remember that university, and studying overseas in particular, is not just about studying, it’s the whole experience that counts as well. Get involved with the many student clubs and societies on offer – run for committee positions, even. Do some volunteer work and/or go on exchange. All your experiences will shape who you are and make you a more complete, well-rounded person. We host information sessions in Australia and around the world!